You had it all planned out so well and you think of everything! And it looks like even more fun because of the boys!! Except for that little cold thing in the night, I hope he is getting better. You were wise to stay in the tent and not try anything risky. I love this post and all your great photos, Lisa. The boys look like they especially enjoyed the food! Such a pretty area, too! Hope you all have a nice day! What a grand place to camp! It must be wonderful to be able to do so on your own property. Sorry about Reid coughing all night but the rest of it sure looked like a lot of fun! Now I would like some corn, please. What a great adventure for the boys! It looks like the boys had a wonderful time! I love the potato chip bill! 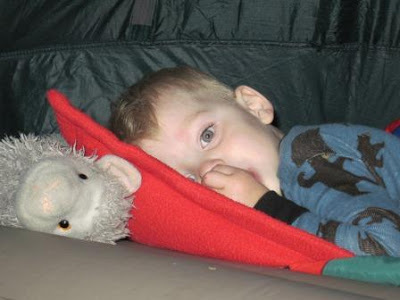 JDaniel slept in a tent for the first time when we were in New York and he loved it. Ha ha...what fun! 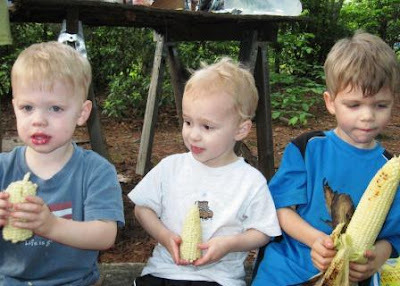 That corn looks so good, too. How fun! We have a camping spot on our land, only down the mountain, at a creek area that we go to all the time in summer. It's nice being close to home, yet not home. :) That fire roasted corn looks SO GOOD. Will have to try that! That looks like a perfect camp site. Boys playing on rocks...what could be better! Fun to be along with you. I bow down to you. I don't know how you do it with twins- I barely can do it with 1 kid at the time! Looks like a great campout. You are more brave than I am. The boys are so cute. I wanna go camping with your family! It looks like a blast!!! 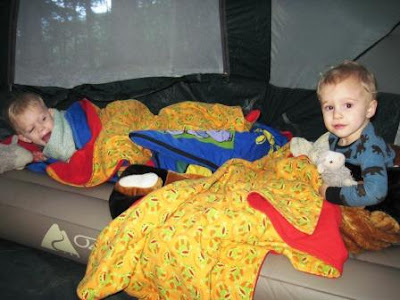 You are so brave--I waited until my "baby" was 3 before taking them camping. It's still so much fun, though. My 3 year old loves camping, me not so much. We're going to backyard camp at a relatives this weekend. It looks like you all had lots of fun. your dream was rather interesting! :) your kids are too cute. glad they had a good time. Loved this link! We were camping this past weekend, but my kids are teens. I was unsuccessful at capturing the elusive teen this weekend. The corn photos are my favorite! What a fun adventure. Sorry about the cough :( Looks like the boys had fun! Yummy fun food too. LOVEd this all SO much Lisa! 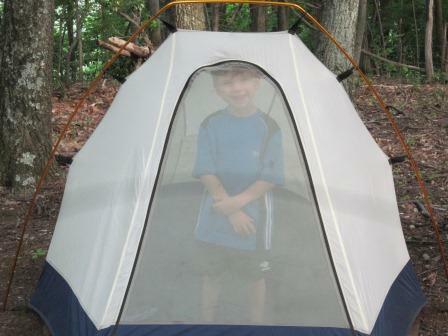 Made me all nostalgic about camping when I was just a tike! FABulous family photos... your little ducky is too stinkn CUTE. My Jax (3yeal old) could, no problem, eat an entire can of Pringles... if mommy let him! Girl... if you can take TWO toddlers camping, I can manage taking one! You've inspired me! You bought Pringles!!! I am shocked...lol. Looks like a great camp you guys have set up. I am glad it went well with the twins for their first time. I love camping! You are lucky that it's warm enough. We would freeze or float away here. 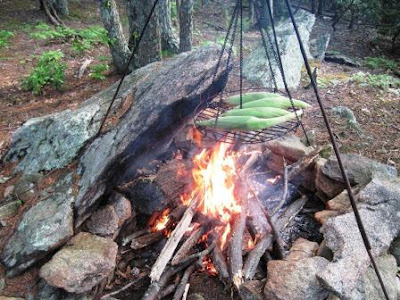 Perfect camping food! 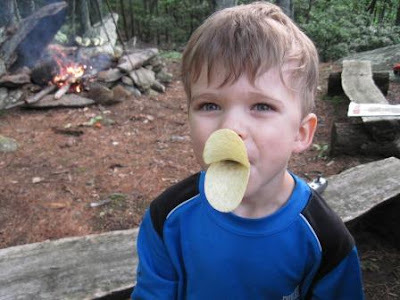 I be lovin' me some Pringles! What a beautiful, peaceful spot to camp in! I don't camp, but I think I'd reconsider in a spot like that. Great photos--the boys are really cute! Glad you had fun. Glad it worked out great even though Reid was sick... Sounds like your family will be doing that again!!!!! I still consider pringles a special treat! It looks like you had a great time! Looks like fun! 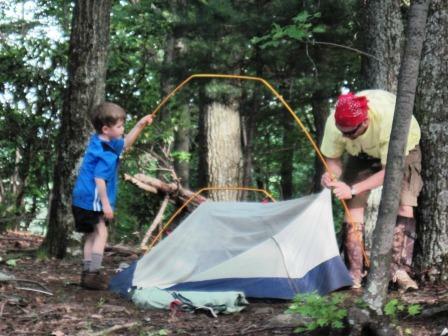 I haven't been camping in years but I sure loved it growing up. Wow, looks like you had to drag a lot of stuff up the mmountain. All the comforts of home. I have been taking an herb called hyssop for coughing and it seems to work really well. Not sure if kids can take it or not. 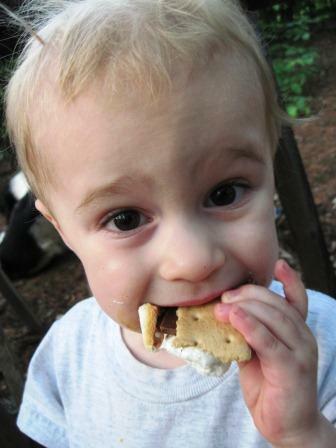 Smores sound so good. Haven't been able to eat those in years. 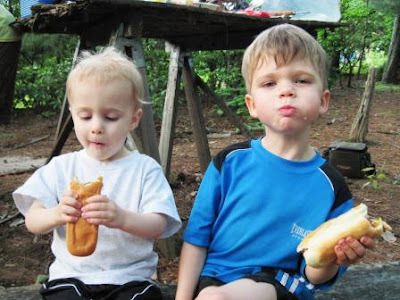 Junk food treats are necessary on a camp out! Looks like you guys had fun, except for the coughing! It looks like the boys really had fun. There's obviously no mosquitos out yet or the boys wouldn't be shirtless! What a fun trip! Awesome shots of your boys! You can see the joy on their faces. And, yes, corn is awesome over a fire! it looks like so much fun, but rather you then me. Sounds like fun! We have done the camping thing and it wasn't the twins who had the problem but Taylie she pushed her little face against the window and screamed "Out mama, out!" until she fell asleep. It was so sad. 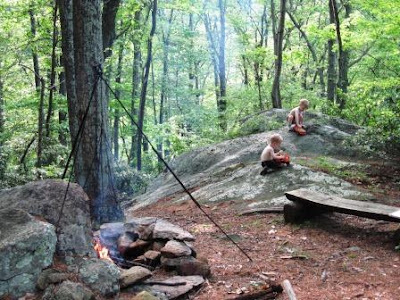 How nice to be able to go wilderness camping so close to your home (in case of a problem) and not feel like you are in the back yard. I did a good bit of this with my child when we were both much younger. Don't think I would have been brave enough to attempt it with three so young. It looks/sounds like you had a good time. 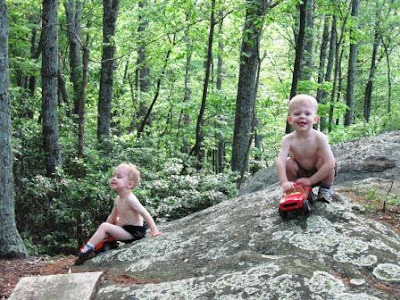 I definitely think camping and boys make the perfect combination! Roasted corn sound delicious! i had to chuckle at the chip beak...hilarious! Your kids are such fun photo kids! It looks like you had a lot of fun! Your boys are so cute!